My friends and I occasionally break out the soccer ball and peg out a spot in our local parks for a casual game of soccer, or maybe if we're feeling classy, boules. It's tricky to find a secure spot in the Inner West though! Where's the best flat bit of grass, preferably with a fence, where you can hang out with a picnic and have a quick game without losing your ball on the highway or interrupting other picnickers? Enmore Park is my local, although it can get a bit crowded on weekend afternoons. There's enough flat space for a good game, and a few handy trees to use as markers - just don't kick too hard because Victoria Rd is busy! 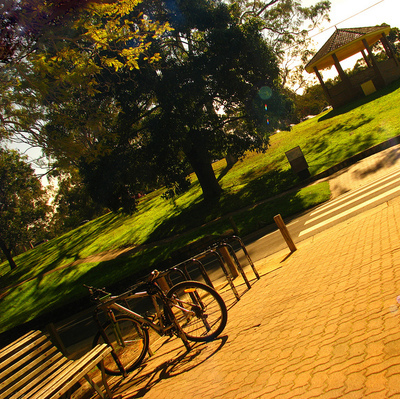 If I'm out west, Parramatta Park is massive and always has heaps of space to share. Lots of great flat expanses of grass. I also like Centennial Parklands, but they're a bit out of my way. Primrose Park in Cremorne is a great spot for kicking a soccer ball around. In fact, it's actually used for kids soccer games on the weekend, so the ovals are always maintained. It's a dog friendly park, but their are two huge ovals and plenty of grassy hills, so you won't be fighting for space. Otherwise, St Leonard's Park in Crows Nest is another good option, although the oval area can get flooded after heavy rain. If you'd prefer somewhere with less people, I'd try out Rawson Park in Mosman.